Directions: Located a couple miles north of the town of Ennis. 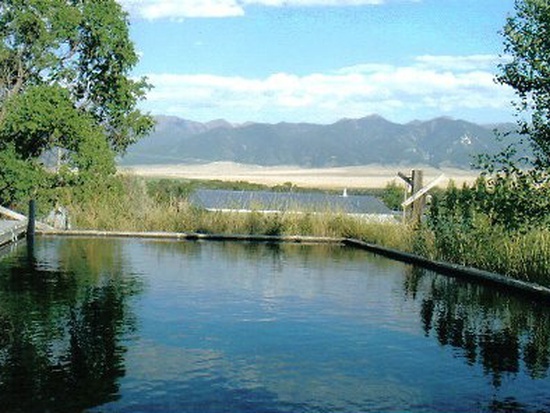 Features: Ennis Hot Springs has is the warmest hot spring in Montana at 193 degrees! It's source appears to be a well. Status: Private and unknown what it's use is today. Directions: Located on the grounds of the Montana State Psychiatric Hospital. This is in the small community of Warm Springs, 16 miles south of Deer Lodge. Features: In 1865 a resort began development here. After 1877 it operated as a resort and psychiatric hospital at the same time until sometime prior to 1912. Recently the springs were used for geothermal heating in the 1980's but appear to be currently unused. History: The hot spring consists of a 40 foot tall limestone mound which rises above the otherwise level valley floor. The Native Americans called the area around the spring the "Lodge of the Whitetailed Deer" due do the numerous deer who called the area home, the name was simplified to Deer Lodge. The spring has been the site of a psychiatric hospital since 1877, it became the state facility in 1912. Directions: Silver Star Hot Springs (previously known as Barkell’s Hot Springs) is located between Whitehall and Twin Bridges in the small community of Silver Star. Features: An interesting fact on Silver Star is it is the third oldest town in Montana. Silver Star hot spring consists of five springs with a temperature of 162 degrees which is the third hottest in Montana. History: These hot springs were first claimed in 1973 when they were piped a short distance away into a home for baths and heating. 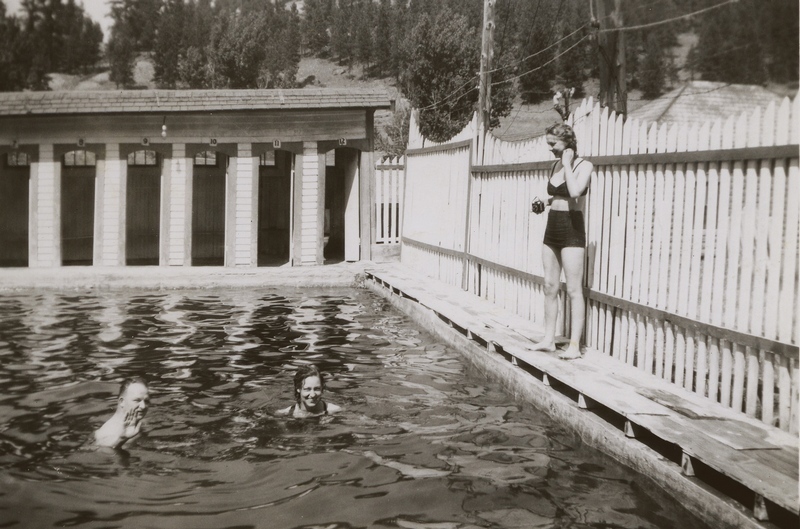 Soon after a large outdoor pool was built, it was said to be popular with those in the area. 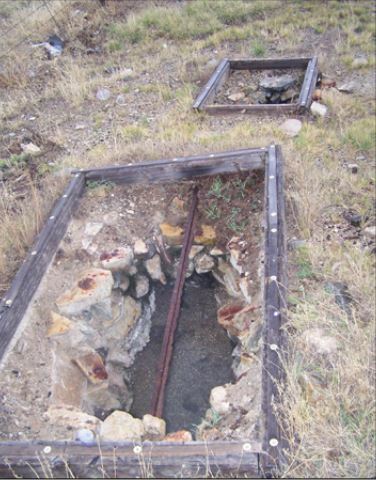 Another source noted the springs were used as a laundry for the area gold miners. Status: Currently the hot springs are used to heat the residence as well as a commercial green house. 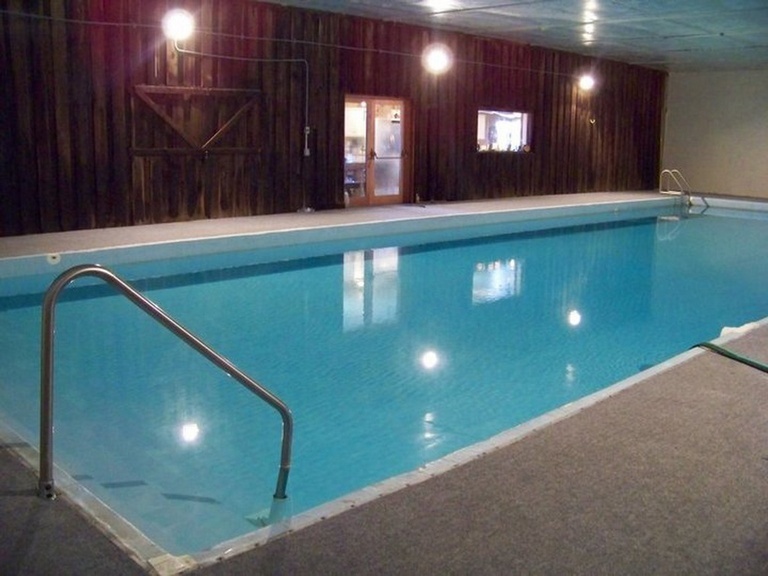 The site has an indoor and outdoor pool as well. It was for sale as recently as 2016 but appears to have been sold or taken off the market. This is a private family home with no public access. Directions: Located 35 miles south of Ennis. 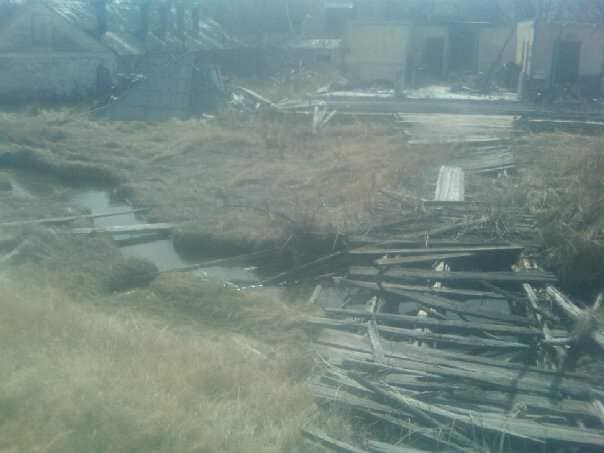 Features: I found zero infomation on this one, there is a home on the site of this spring, we assumed it is private. Directions: Located 15 miles east of Livingson. 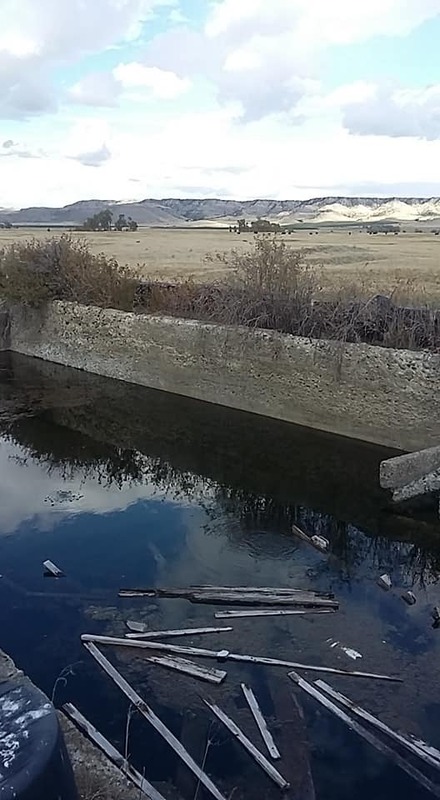 Features: This hot spring has an interesting history, it was once a large resort but was lost to a fire in 1932. If you are into history Google this one. It does not have any development today. 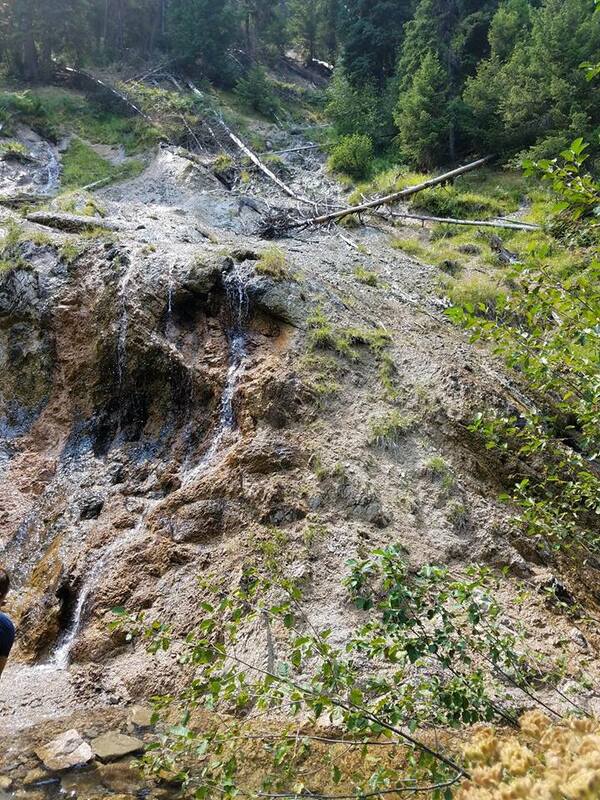 Directions: Alhambra Hot Springs is located about 13 miles south of Helena near the small community of Clancy, MT. Features: Today the 133 degree water from the springs is is used for geothermal heating of a retirement home located on the site of one of the spring sources. There are no public access to the springs. History: The springs were originally bought for $3,000 of gold dust in 1866, development began here with log hotel that same year. 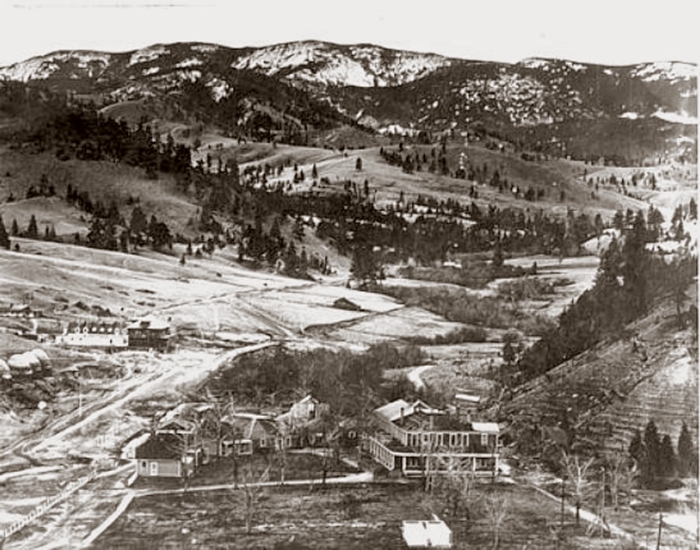 By the 1880's two hotels, Alhambra and Sunnyside Hot Springs occupied the site through the 1950's. 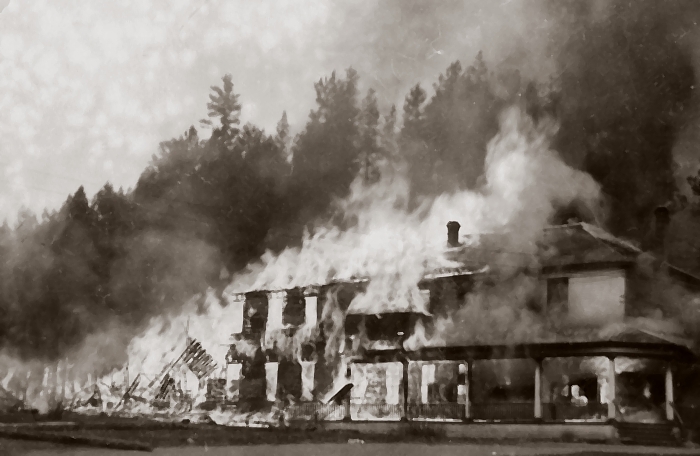 The Sunny side resort burned down in 1959 and was never rebuilt. Directions: Located about 18 miles east of Butte, MT or 8 miles west of Whitehall. 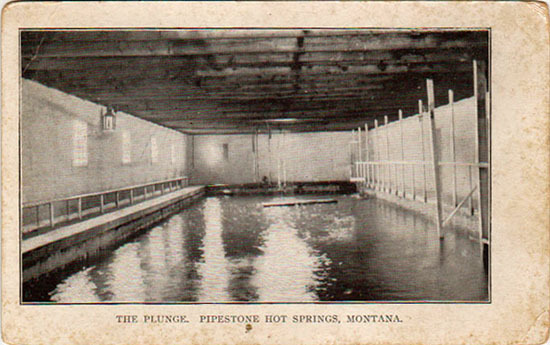 The hot springs are located just off I-90, within a mile of the Pipestone exit. Features: This one is dilapidated abandoned resort, it remains closed to the public. It does not have any development today. 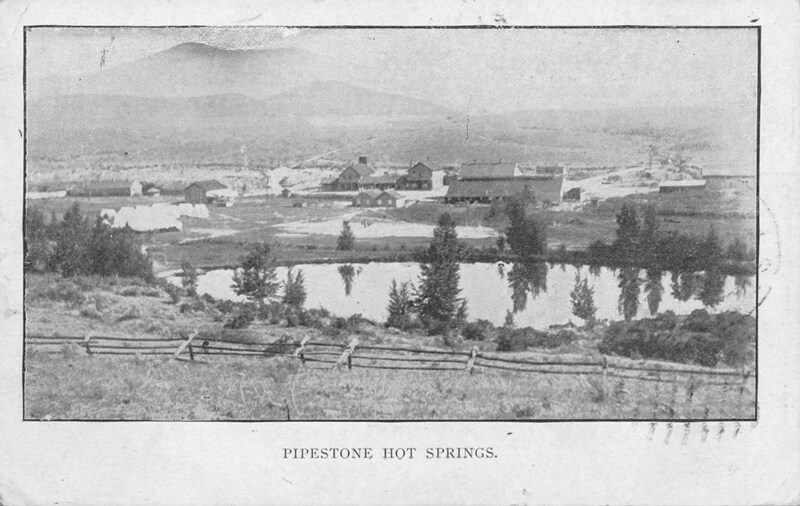 History: Pipestone was discovered in 1862, the springs got it's name from a material the tribes in the area used to make clay pipes. By the 1880's a hotel was constructed on the site along with several other buildings. 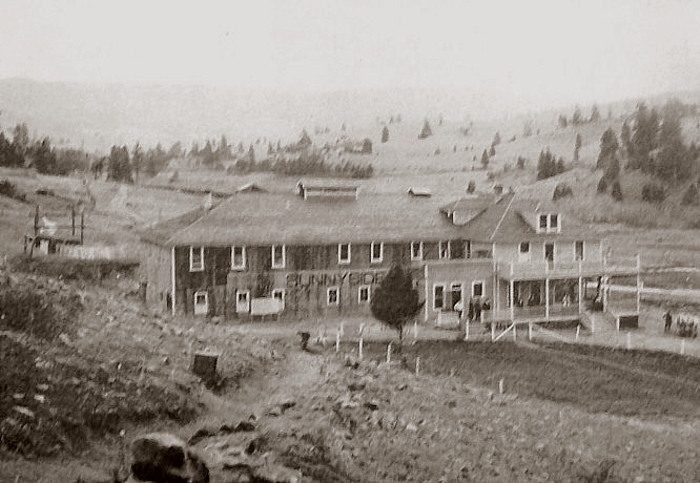 In 1912 the springs were home to a hotel and 100 canvas roofed cabins as well. Shortly there after the hotel burned, rebuilt and burned down again, it was unknown if it was rebuilt a third time. The resort operated until the 1960's when it closed for unknown reasons. 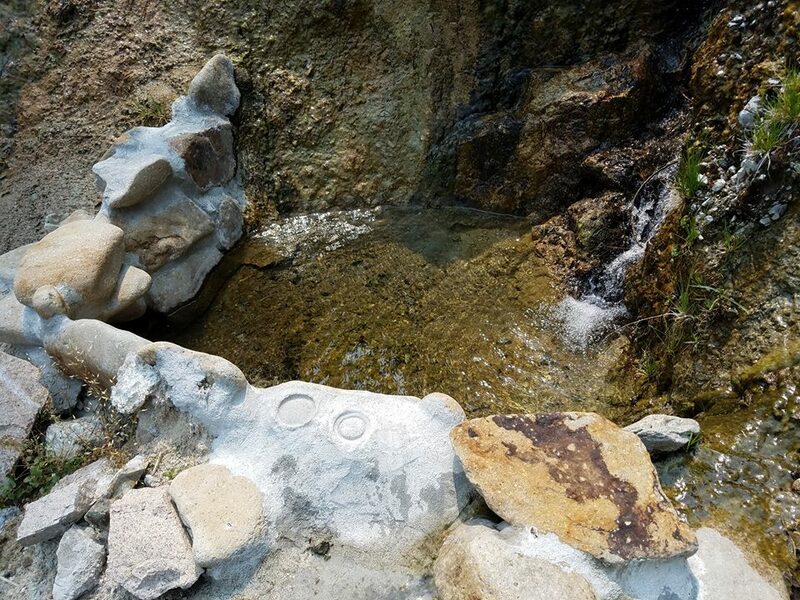 Status: Currently this hot spring is private property and there is no public access to the site. 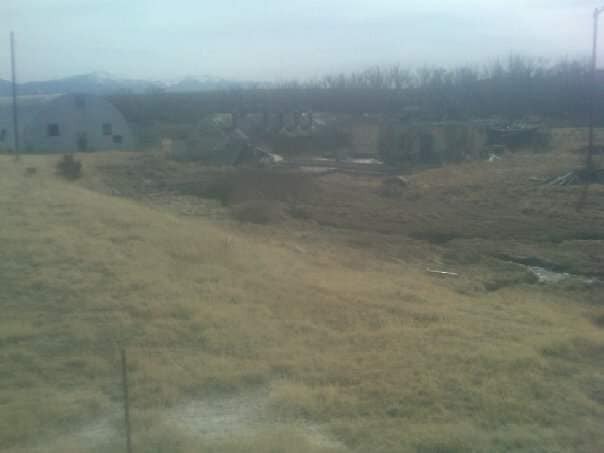 You can however see the structures that remain from a county road nearby. Directions: Located 12 miles SW of Twin Bridges. Features: This one is another old resort, it is now private. Status: Private and not accessible. Directions: Located 20 miles south of Alder, Montana near Ruby Reservoir. 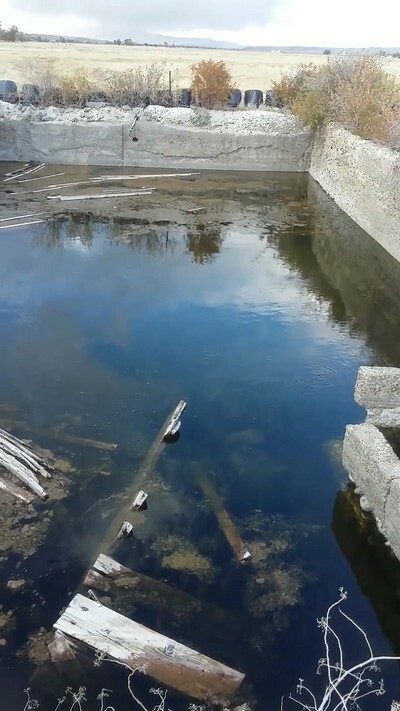 Features: A small spring located on private land, the springs are not developed. 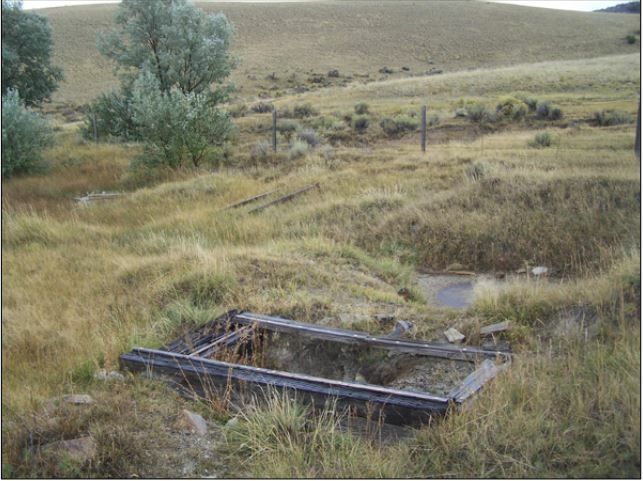 History: Located on the Salt Lake Road, this was an early route travelers used to reach southwest Montana's mining camps such as Virginia City and Alder Gulch from Utah. The springs were developed by James W. Puller in 1872 and was popular during the gold mining era. Status: Private and not accessible to the public. 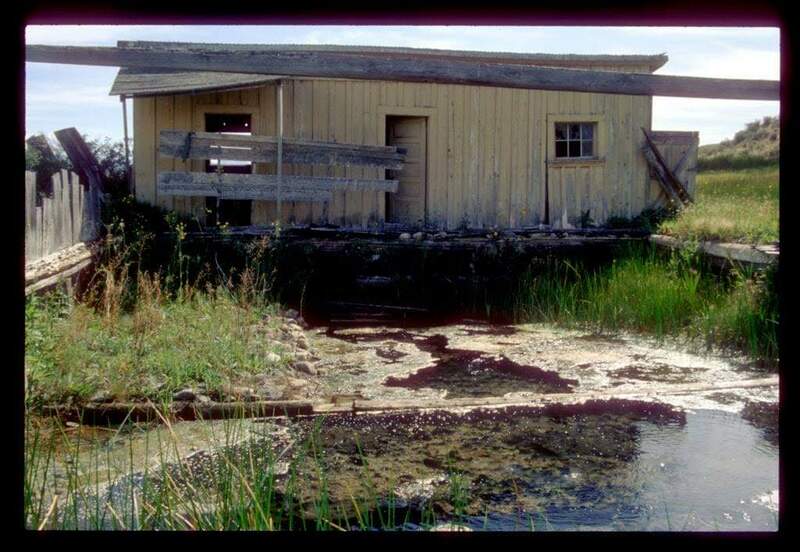 Photo provided by Jeff Birkby, taken in 1985 showing remnants of the changing rooms and pool. Directions: Located next door to Lolo Hot Springs and was at one resort prior to the 1980's. Features: Located on private land, it was for sale about ten years ago but remains closed to the public. Directions: This one is hard to find. This spring is 31 miles southwest of Darby on the west side of Painted Rocks Reservoir. 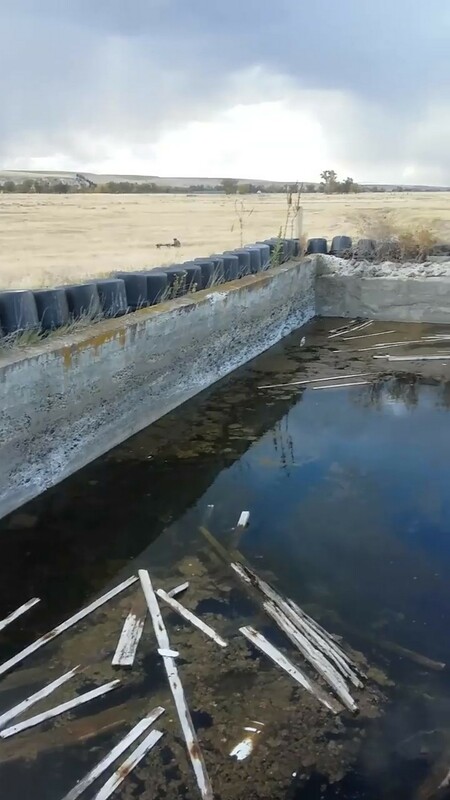 Features: A shallow homemade pool with room for a couple people. It is on the side of a hill above Blue Joint Creek. Status: Public, Bitterroot National Forest. Temperature: 84 degrees, feels warm after crossing the creek (after you fall off a log into the creek)! Directions: Located in SW Montana, south of Ennis and west of Wade and Cliff Lakes. Features: Very little infomation is available on this one. This one may be nothing but a warm mudhole. Status: This is on national forest land but there are buidlings near by. Directions: Located 56 miles southwest of Malta, MT. Features: This was listed as a swimming hole in one source but the infomation is not up to date. Directions: Located on the west side of Ruby River Reservoir south of Alder, MT. Features: This is a warm deep pond, I remember going here as a kid, back in the late 1980's it had tropical fish living in it somehow. Status: This is private and no longer contains fish apperently. Directions: Located near Three Forks Montana, south of Madison Buffalo Jump State Park. Features: The once popular swimming hole with the locals a generation or two ago is currently abandoned and seen better days. Apparently a wooden fence surrounded this pool at one time as well. Status: At the time of this posting we believe the pool on private land. Please ask permission from the landowner before visiting. Temperature: Unknown but it is heated by a warm spring. Photos provided by Scott Van Wyk from our Facebook Group. Thank you!